The North Dakota Certificate of Authority Foreign Corporation Application | Form SFN – 13100 is the form required to obtain a Certificate of Authority from the North Dakota Secretary of State when a foreign corporation wishes to transact business within North Dakota State lines. This is a staunch requirement and the application must be accompanied by a Certificate of Existence or a Certificate of Good Standing issued by the foreign corporation’s home state. This certificate must be dated within 90 days of the filing date of this application, if it is to be accepted. 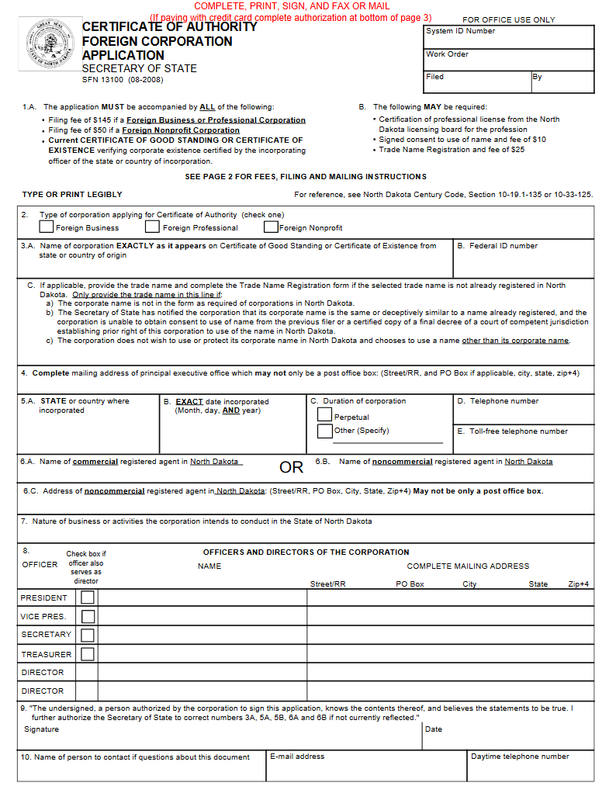 This form may be used both for foreign profit corporations and foreign nonprofit corporations. A foreign profit corporation will need to remit a payment of $145.00 to cover the Filing Fee. A foreign nonprofit corporation will need to remit a payment of $50.00 to cover the Filing Fee of a foreign nonprofit corporation. You may pay for this Filing Fee with a check or certain major credit cards (Discover card, MasterCard, Visa) if you are filing by mail. Checks should be payable to Secretary of State. If you are faxing in this filing, you may only pay with a credit card. 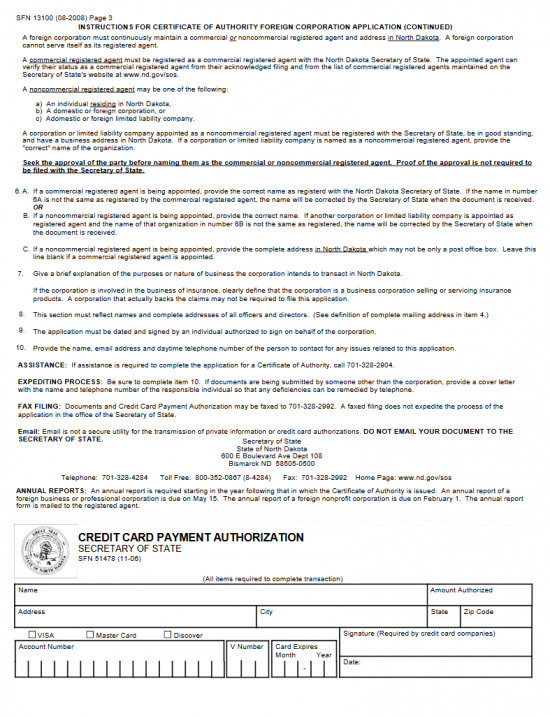 In order to pay the Filing Fee with a credit card, you will need to fully complete the “Credit Card Authorization” form at the end of this document. Step 1 - The first Items (Item 1A and 1B) will state requirements for filing this application. Make sure you read these carefully as you will have to adhere to them. Step 3 - In Item 3A, report the Full Name of the foreign corporation as it appears on the Certificate of Good Standing or Certificate of Existence (including capitalization, punctuation, and/or abbreviations). Report the filing entity’s “Federal ID Number” in box 3B. Item 3C is optional and exists only if the filing entity may not use its Name to operate in the State of North Dakota (depending upon the circumstance you may need to submit a Trade Name Registration Form, Court Decree, or Signed Consent). If the filing entity may not use its True Name, enter the Trade Name to be used in Item 3C. Step 4 - Document the Principal Office’s Physical Address in Item 4 (Building Number, Street/RR, applicable Unit Numbers, City, State, and Zip Code). Step 5 - Report the State or Jurisdiction where the foreign entity is incorporated in Item 5A. Then, in Item 5B, report the Date of Incorporation (mm/dd/yyyy), making sure this is an exact date. In 5C, indicate if the foreign corporation intends to operate indefinitely by selecting the first box (labeled “Perpetual”) or document the Date of Termination/Dissolution by check the box labeled as “Other” then writing in this Date on the blank line provided. Report a reliable Phone Number where the Principal Office may be reached in Item 5D. If there is a Toll Free Telephone Number this may be reported in Item 5E. Step 6 - If the Registered Agent obtained is a Commercial Registered Agent (in North Dakota), then enter the Full Name of the North Dakota Commercial Registered Agent in Item 6A then, proceed to Step 8. If you have gained a Noncommercial Registered Agent in North Dakota, leave Item 6A blank and proceed to Step 7. Step 7 - If you have obtained a Noncommercial Registered Agent (in North Dakota), enter this entity’s Full Name in Item 6B and the Physical Location of the Noncommercial Registered Agent in Item 6C (Building Number, Street/RR, Unit Number/PO Box, City, State, Zip Code). This must be the Physical Address and may not be a simply a P.O. Box Address that is in a different physical location. NOTE: You must obtain and maintain a North Dakota based Registered Agent from the time of applying for the Certificate of Authority to the time you surrender the Certificate of Authority. Step 8 - Indicate the Purpose or Nature of the activities the foreign corporation in the State of North Dakota. That is, why and how will this corporation operate in the State of North Dakota. Step 9 - In Item 8, you must provide a Full Roster of the Officers and Directors of this corporation. There will be a line for the President, Vice President, Secretary, Treasurer, and two more for Directors. There will also be a box to check only if the Officer also serves as a Director. Each row will contain a Title, Name, and Complete Mailing Address which needs to be filled out. Step 10 - An authorized Officer or Director should provide his/her Signature below the binding statement present in Item 9. The box next to this is where this party must report the Date of Signing. Step 11 - In Item 10, you must provide some Contact Information in case the North Dakota Secretary of State needs to speak to someone with the foreign corporation regarding this application. In the first box provide the Name, in the second box provide a reliable Email Address, and in the third box provide the Daytime Telephone Number for this Contact Person. Step 12 - Organize all documents that must be submitted with this application including any additional filings then package them with the North Dakota Application For Certificate of Authority | Form SFN – 13100. This must be accompanied with either a check that is payable to the Secretary or State (if mailing or faxing in) or with a Completed Credit Card Authorization Form (if faxing in). 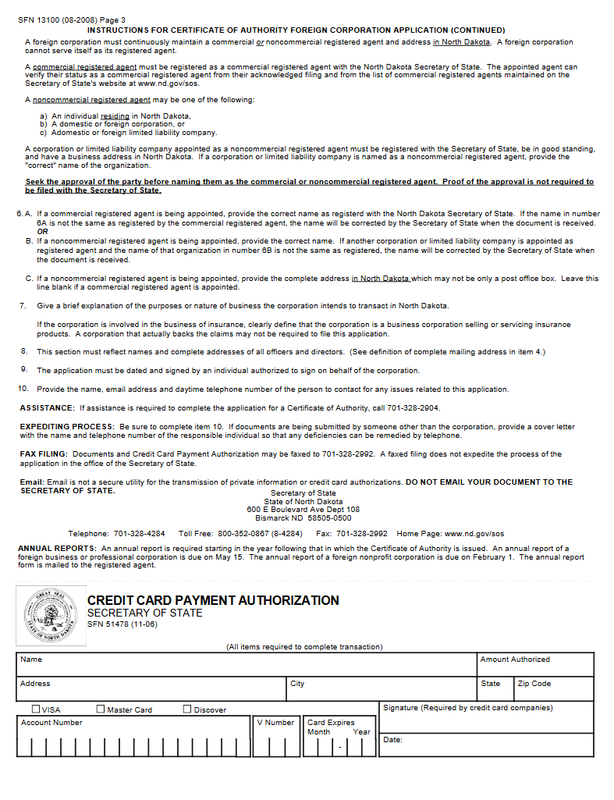 The Credit Card Authorization form will allow you to pay all applicable fees with a Discover card, MasterCard, or VISA card and will require the Amount, Card Holder’s Name, Address, and Phone Number, Credit Card Type, Credit Card/Account Number, Security Code (on the back of the card), and Expiration Date. This must be Signed and Dated by the Card Holder. This form is located on Page 3 of this application. Filing Fees for Profit Corporations (of any kind) will be $145.00 while Filing Fees for Nonprofit Corporations (of any kind) will be $50.00.